On the last track, we discussed Discipline Techniques to Avoid. These included yelling, overuse of time-out, subtle consequences and sulking. Do you have the parents of a child with Asperger Syndrome who is making decisions about how to school their child? Do they prefer public school or private school? What suggestions have you made to them regarding their child’s special needs in the classroom? Cherise, age 35, had a daughter, Mina, age 4, who was had with Asperger Syndrome. Cherise stated, "I’m trying to decide whether to home-school Mina or not. She’s currently in pre-school, and very intelligent. I only worry about Mina as she gets older, learning to adjust to new social settings and just needing a lot of individual attention. I’m not sure if she can get that in a public school. If I do decide to send her to public school, what are some things I should look for in classrooms? What characteristics of a learning environment will be optimal for Mina?" I stated, "First, let’s discuss having a small setting. Children with Asperger Syndrome, as you know, require considerable individual attention. Small work groups and the opportunity to break tasks down into very small steps tend to help them learn." Cherise stated, "I could see Mina getting that at home, and maybe in a public school…but I’d have to do a lot of investigation. What about transitioning to a changing environment?" I stated, "Second, let’s discuss an orderly and predictable environment. As you also know, children with Asperger Syndrome tend to do best in settings that are predictable, in which they feel they know what to expect. You might want to minimize transitions where possible. Of course, a typical school day does involve lots of transitions from one activity to another. If in a public school setting, you might want to talk to Mina’s teacher and let the teacher know about this. Chances are, the more comfortable Mina is with her setting and routine, the more she’ll feel able to adjust to surprises and changes in her routine. Learning to tolerate transitions is a gradual process, but many kids improve with practice." Cherise stated, "I can see how this could be accomplished in a public school setting…I’ll tell you one thing, though…if Mina were home-schooled, she probably wouldn’t have half as many opportunities for social interaction with other kids, and I know that’s important, even if it is difficult for her." I stated, "I agree. Educating Mina in a setting along with typical children, where possible, is could be the best way to enhance her social development, because that setting will provide models of the kind of typical social skills she will need to learn. However, it is possible to join a group of other home-schooling parents and help Mina get social interaction that way." Cherise asked, "What actual teaching techniques do you think will be most beneficial for Mina?" How might you have responded? I stated, "I would advocate learning by rote. Having facts stated and then repeated tends to be an effective technique for teaching basic content. Children with Asperger Syndrome often need to have material laid out play before them, so this technique could be helpful." I continued to state, "Also, part-to-whole sequences are another useful technique. Students with Asperger Syndrome tend to learn complex material best if they are able to use inductive, rather than deductive reasoning. This is a crucial distinction, because many students learn better using a combination of both inductive and deductive reasoning. Inductive reasoning starts with the specific, and moves outward toward generalities. For example, learning about the Earth, then the solar system, then the stars and galaxies. Deductive reasoning begins with the broad concept, like the universe, and then deduces specific information." Cherise stated, "Thanks, this has all been very helpful information." Do you have a Cherise who is deciding whether to send his or her child with Asperger Syndrome to public school versus home-schooling? Could he or she benefit from hearing this track? On this track, we discussed Sensory Overload. This included hearing, vision, smell and taste and touch. - Powers, M. D., Psy.D., & Poland, J. (2002). Asperger Syndrome and Your Child: A Parent’s Guide. New York: HarperCollins. - Tippett, J. (2004). The Educational Experiences of Students with Asperger Syndrome. Kairaranga, 5(2), 12-18. 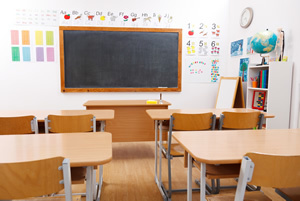 What are 5 things to consider when choosing a classroom for a child with Asperger Syndrome? To select and enter your answer go to CEU Answer Booklet.